Gender has traditionally proven to be a `blind spot' for new institutionalists. This book bring gender to the fore as a critical aspect of institutions and opens up new avenues to interrogate the dynamics of power and change. 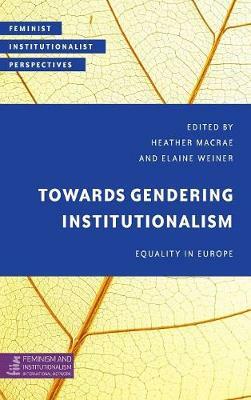 Casting its empirical lens on the EU, where institutional efforts to realize gender equality are quite pronounced, the book interrogates attempts to bring about more `gender just' polities - supranationally, nationally, and more locally. The book takes a `best case' scenario - with explicit transformative aims to the social (gendered) order - in order to illuminate how institutions and their gendering, help and hinder institutional change. In doing so, it aims to: 1) consolidate and expand the theoretical `toolkit' in terms of synergies between feminism and new institutionalism's various strands; and 2) bring it to bear on the trajectory of Europe's gender equality agenda towards better understanding the institutional and institutionalized challenges to redressing gender inequalities.